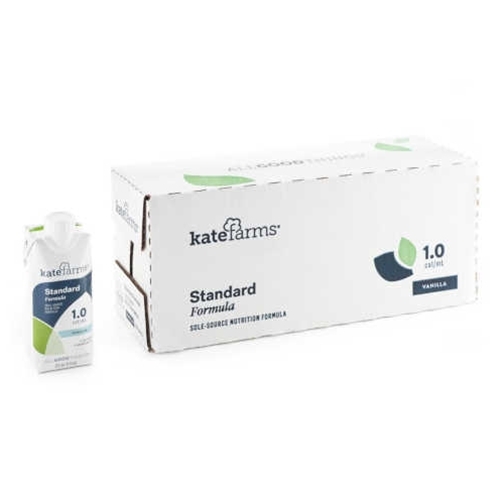 Kate Farms Standard 1.0 Formula from HealthyKin.com is a ready-to-use oral and tube-feeding formula. Each 325 mL carton provides 325 calories and delivers 24 vitamins and minerals and 29 antioxidant-rich superfoods. Kate Farms Standard does not contain any of the common allergens (milk, wheat, soybeans, eggs, peanuts, tree nuts, fish, shellfish) or corn products. I love these shakes! Amazing price, and very fast shipping. I always get my order within 2 days or less. The shakes themselves are delicious & so nutritious! I have been drinking these drinks for about 3 months. Love them. I just ordered 3 more cases. It was okay. I really didn't care for the taste. I don't think I'll purchase it again. None of those shakes is mentioning sugar amount. Katefarms are hiding this info? Why? Best price you can find around, even cheaper than Amazon. Super quality product and great customer service, UPS list a couple of my boxes and healthy kin made it right fast!! If you are looking for a good source of protein without all the artificial junk this is it! Really helped me keep my weight while fighting Sibo. The product was shipped very fast, price was great. Very helpful as this is very important for my son's dietary needs. Very happy with this product! I ususally give these a 5 star rating based on price and how amazing these taste until recently. Kate Farms has changed the formula and tho these are still good the original formula was way better. And now Healthy Kin has raised the price on a case. It's actually cheaper now to buy from Amazon if you have Prime but I've decided these are too expensive for me and I have found an alternative. I'll miss u Kate Farm! These shakes are so good! As someone who has trouble with dairy, it is SO NICE to find something tasty (and healthy) that doesn't make me feel bad! I love, love these! To recover from SiBO, this met my needs and continues to do so. I need nutritious shakes for supplemental calories and Kate's Farm is the best tasting I've tried. Healthy Kin is a great seller with fast shipping. Kate Farms are the best tasting meal replacement drinks for tasting good! Thank you for the super speedy shipping!